My new friend and professional library colleague, Sara Gonzales, has a new book out today on 3D printers in libraries (see below), so it seemed like a good time to list some of the best books, papers, and resources on the topic. Here is a selection of the best up-to-date books to learn about deploying 3D printers in your library. This title is actually an issue of Library Technology Reports from ALA Tech Source. The report covers how 3D printers work, common terminology, types of plastic, prices and specifications for printers, and staff skill requirements. Published in 2014. Buy from the ALA Store, Amazon, or Barnes & Noble. Part of the “Tech Tools for Learning” series. This book is aimed at the K-12 school librarian. “Written in non-technical language, the book introduces the technology, shows how to get started, and offers ideas for creating project-based learning models.” Published in 2015. This title is the newest volume (#22) in the “Practical Guides for Librarians” series. The comprehensive book covers everything from writing the original proposal to selecting printers, addressing staffing issues, developing policies, and more. Published in 2016. 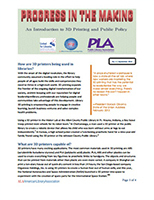 The first report from the American Library Association in the “Progress in the Making” series covering 3D printers and legal liability and concerns for library professionals. Published in September 2014. Access the full-text paper (PDF). 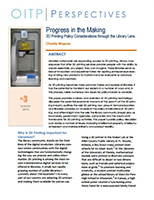 In this second report in the “Progress in the Making” series from the American Library Association, Wapner urges librarians to develop policies to “address the social, technological and political complexities that result from the rise of 3D printing.” Published in January 2015. Here is a selection of helpful resources on 3D printers in libraries. 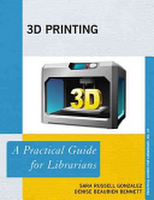 3D Printing Glossary – A LibGuide of 3D printing terms from Kent State University Libraries. How 3-D Printing Works – A good tutorial from HowStuffWorks. 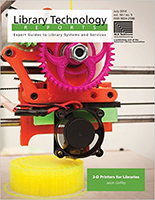 Librarian’s Guide to 3D Printing @ Your Library – A LibGuide from UF Libraries. Map of 3D Printers in Libraries – Amanda L. Goodman’s page with an interactive Google map with over 650 entries separated into categories. Thingiverse – A large community for finding, making, and sharing 3D models, by MakerBot. Tinkercad – A basic online CAD website to create 3D models for printing.